It is without question that global labour schemes are currently subject to massive reform as a consequence of globalisation and technological modernization. Argentina’s deeply-ingrained "eight-hour workday" is no exception, but its profound economic and cultural roots pose important challenges for creating a future that yields effective economic development, while protecting the lifestyles and interests of the Argentine people. In presenting his most recent publication, After Work: Argentine Employment in the Fourth Industrial Revolution, Eduardo Levy Yeyati unravels the dynamics behind these concerns, laying out an optimistic future for the country’s competitiveness on the global market, but also cautioning Argentines that a lack of openness to the inevitability of these transitions will render progress impossible. 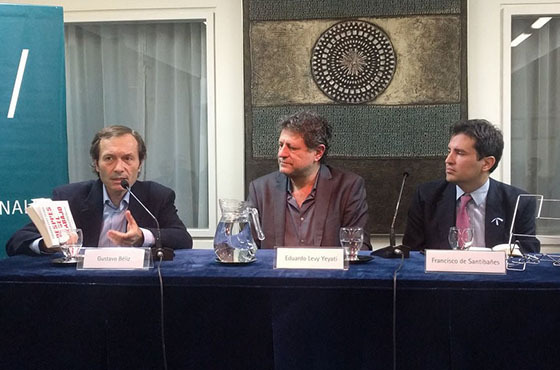 Yeyati conveyed the importance of dismantling common social preconceptions surrounding Argentine employment structure, which discourages many Argentines from embracing the new and changing patterns than have started to take root. " Argentines are accustomed to the workday patterns that have existed since the Industrial Revolution, whereby we clock into the office at 9AM, and are heading home by 6PM. Most of us fear the ‘end of the workday’ because we have come to associate losing work with losing income", he remarked. "But that may not necessarily be that case. The eight-hour workday, simply put, is heading towards extinction. This is a trend we see both globally, and in our country. Times are changing, and we can now generate new sources of income that are more competitive on the global market, that will not demand such a routine from us". In the wake of multiple recent economic crises, workers feel the need to accumulate as much income as possible, for as long as they can. Though this may have been a virtuous trait in past years, some of its "side effects" have begun to show—namely high rates of structural unemployment resulting from large demand by technology-based employers, but a serious lack of overall vocational training for potential employees. Though education is absolutely part of the question, Yeyati called acute attention to the fact that this is only plausible in the long term. "Education is vital", he admitted. "But the reality is that immediate educational reform will not occur. The workforce today—and for the next twenty-five years—is not comprised of high school students. They are current professionals, and heads of average households, who lack professional formation in their own offices". Mr. Béliz shared Mr. Yeyati’s concerns, emphasizing that technological debates are not issues solely relevant to the first world. In Latin America particularly—the most unequal region in the world—these changes will be a chance to overcome inequality if met adequately, or a chance to profoundly and irrevocably engrain it if met indifferently. Additionally, the emergence of artificial intelligence provides a viable substitute to Argentina’s "already limited coders", threatening future possibilities of exposing future generations to training in these disciplines. To conclude the session, both Mr. Yeyati and Mr. Béliz advised Argentines to be "neither optimistic nor pessimistic" about technology’s impacts themselves, but to remain hopeful in mankind’s resiliency. Handling the major and pressing challenges these topics bring about will require "revising outdated paradigms, rethinking backward-looking ideas, and, more fundamentally, remembering man’s centrality in the issue when designing new regulations". Both contended that ultimately, technology should be thought of in relation to progress as a means—not and end. "A brief overview by the International Monetary Fund regarding the future of Latin America’s economy and labour force"